I'm wanting to buy a flour bin cabinet from a friend and am not sure what to offer. It's got the flour bin and sugar canister all intact and bread draw it has been painted white, but I cannot find a label of brand or year any thoughts? What a beautiful piece! Doing business with friends can be tricky. Also there are so many factors that figure into market value of furniture/antiques (condition, age, and even supply and demand in your area). You don't want to over or under pay. Have you considered getting 2-3 bids from a local antique dealers and then offering her an average of the bids? Some dealers offer bids based on detailed photos, others may want to see it in person. Hope you are able to make a good deal!! My guess it is from the 1920s or 1930s. Ask your friend what she or he wants for it. 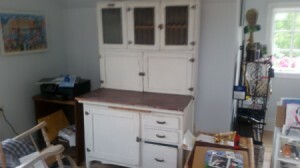 These cabinets are becoming more rare so I believe the value will be steady or increase as time goes on. Hopefully you can offer a reasonable price that will be fair to you and your friend. If you offer a price and it is accepted, I hope that someone in the future does not tell your friend, "you really got cheated - that cabinet was worth 3 times that amount!". This does happen quite frequently so be careful when dealing/buying where friends are involved. I have a similar cabinet that I inherited from my mother (only mine is all original) and I consider mine as "priceless" so that is no help to you but I would recommend that you ask for an appraisal before making an offer. Any refurbishing that is done to antique/vintage pieces lowers the value (usually lowers it by 1/2 or more to real collectors) and since this one has been painted remember to include that fact in any research as that means the value will be lower than an original piece. 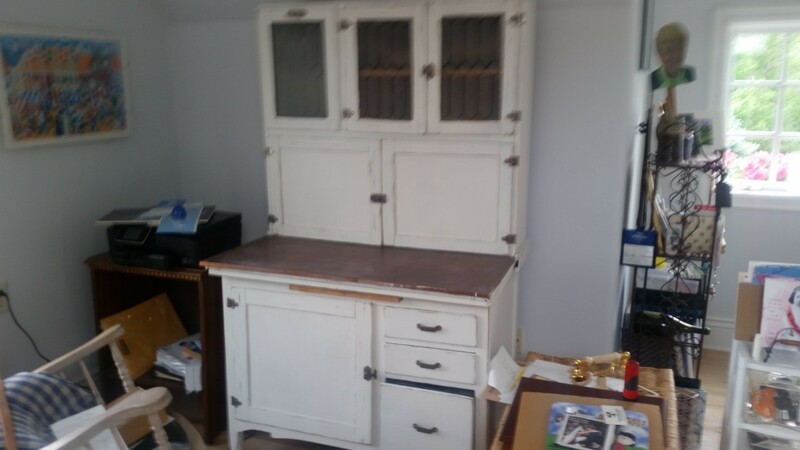 This cabinet is called a Hoosier Cabinet and was probably made between 1900-1950 but I would think closer to 1930-1950 (but many were also made in the 50's). There were many styles and sizes produced so it is difficult to research as you may never see an exact same piece for sale or sold. There are several sites that offer free appraisals but check them out first so you know "free" is not a gimmick. A better option is Barneby's but they charge $17. I hope you and your friend can reach an agreeable price that sets well with both so you can purchase a lovely and very useful "keepsake" and not lose a friend in the process. I would do a search on eBay to see if there is one similar for sale and see what the asking price is.